One thing I notice aboout this movie is the lack of merchandise and toy. There was hardly anything made for this movie. Listed here is what is available from the movie. Underdog Movie T-shirts - Found on Ebay. Not sure if it is offical merchandise or not. UNDERDOG MOVIE SINGAPORE NATIONAL DAY POSTCARD - This looks Legit. Saw this on Ebay. The movie was shown in Brazil. Box office doesn't say anything about Singapore. Look for Ebay Item# 220144248972. I bought it to check it out. 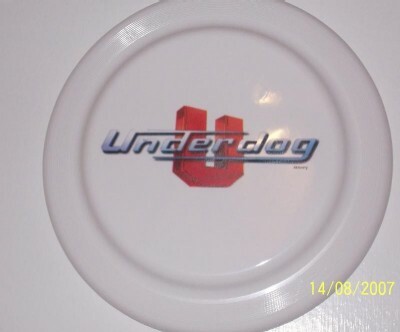 Disney UnderDog Movie Promo Frisbee 2007 - I saw this before the movie came out. It is real. Disney UnderDog Movie Promo t-shirt - This came out before the movie. This is real but simple. 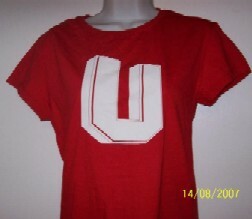 A red shirt with the U Logo on it. Not very creative. Underdog Large Movie Mylar Poster (Jason Lee): Oh Wow. Another poster. This is real. It came out before the movie also. Movie Police Patch. Found this on Ebay. This looks so cool. I want it. Ebay Item# 120196846584. There were other posters made of various sizes. No toys made for the kids. Period. Disney was very lax on this movie. Please Email Me if you find merchandise/toys not lsted here. Page Created on Janaury 14, 2008.